An honest assessment from Aberdeen manager Derek McInnes brings to a close our coverage of tonight's action at McDiarmid Park. Thanks for your company and please join us again tomorrow for five more matches that will need to go some to match the entertainment value of tonight's match in Perth. "Before the game, it was two points dropped, but we did not play well enough to win the game. "We were out of sorts, although we were better in the second half. "Overall, we know it is a difficult place to come and win and the performance had to be better. "The performance was not to the level we hoped for." The aforementioned St Mirren are at home to Dundee, while Inverness Caley Thistle can move to within a point of Aberdeen should they win away to Hamilton, who today confirmed Martin Canning as their new player-manager. Meanwhile, Kilmarnock host Partick Thistle in a mid-table battle and Dundee United will also hope to continue their chase for a European place against Motherwell. The focus at the top of the table switches to Dingwall tomorrow, when Celtic can create a three-point gap at the top if they defeat a Ross County side desperate not to let the four-point gap at the bottom grow between themselves and St Mirren. Just waiting for the response of Aberdeen manager Derek McInnes. Seems like he's got lots to say in the dressing-room first! Alan David Duncan: "With the pasting Saints gave us tonight, that's a point saved not a point dropped." "It was an incredible game and I have said to the lads we went punch for punch with one of the best teams in the land. "They should be proud of their performance. "I am happy with one point and I would have been even more happy with three. "Young Kane up top led the line really well and the intensity of our performance was much more like us." Aberdeen extend their unbeaten run to nine games, but that will be little consolation as their hopes of keeping touch with Celtic suffered a blow with a second draw of the week. St Johnstone move to within six points of fifth-placed Hamilton Accies, while they are now four points ahead of Dundee in seventh. "It was a fantastic game, really end to end at times. "I am really gutted for the boys as I think they deserved three points, especially with those chances at the end. "But I thought the introduction of Smith for Flood changed the game for them. "It is a good point against a good Aberdeen side challenging at the top." Aberdeen slip up for a second time in a matter of days, failing to get the win they needed to return to the top of the Scottish Premiership. They do draw level with Celtic, but the reigning champions have two games in hand, including tomorrow's game against bottom side Ross County. The Dons goal survives another scare as Michael O'Halloran just fails to get his tippy toes to a ball across the six-yard box. Incredible triple save from Aberdeen goalkeeper Scott Brown. First, he gets down to palm away Murray Davidson's low drive then he twice blocks from Michael O'Halloran at point-blank range to concede a corner. Aberdeen break straight up the park and Lawrence Shankland is denied by a block from point-blank range from goalkeeper Alan Mannus. St Johnstone squander a chance to take the lead when they have three players against one on the break, but Jonny Hayes puts in a great tackle to thwart Steven MacLean. Dylan Burnett: "With this goal, Rooney can really challenge for player of the year." Maybe goal of the year, but he will perhaps need to do lots more to challenge for the main prize. Aberdeen push for a winner and Alan Mannus does well to dive low to push away Adam Rooney's low drive, which comes through a sea of legs. The goalkeeper then does well to save as Niall McGinn pounces on the rebound. Adam Rooney finds himself in the referee's book for persistent fouling. Cammy Smith misses a great chance to give Aberdeen the lead when the young forward does well to make space for himself inside the Saints penalty box, where he is found by Shay Logan's chip, but he heads wide from only 10 yards out. Young Chris Kane receives a standing ovation from the home support as he is replaced with Michael O'Halloran. Not bad when you can bring your top scorer off the bench. Substitute Cammy Smith shows ambition with a 30-yard drive, but the striker's shot is straight at Saints goalkeeper Alan Mannus. Another change coming from Aberdeen, with Scotland forward David Goodwillie being replaced with 19-year-old Lawrence Shankland. Liam Caddis replaces Lee Croft as St Johnstone manager Tommy Wright makes his first substitution. "We should talk our game up more. I have watched some dross from that English Premier League, but this has been brilliant - one of the best games I have watched all season." The action is end-to-end at the moment and a David Goodwillie overhead kick from a difficult angle lands on the roof of the St Johnstone net. St Johnstone left-back Brian Easton weaves his way into the Dons penalty box, but he drags his low shot across the face of goal and wide. Shouts for a penalty there from St Johnstone as Chris Kane rushes in on goal challenged by Andrew Considine. A bit of an ambitious call if truth be told. Alan David Duncan: "Adam Rooney, you ginger wonder!" Indeed, a 20th goal of the season for the Irishman. St Johnstone manager Tommy Wright said his players were fired up after Inverness full-back Carl Tremarco suggested they had given up after 70 minutes of Tuesday's defeat at Caledonian Stadium. They certainly were in determined mood, but now they face a real test of their character against a Dons side for whom a half-time substitution appears to have changed the course of the game. Chris Kane has the chance to restore Saints' lead and cap a superb individual performance when the young striker is found by Lee Croft's cross, but he misses it completely as he attempts to power the ball home from 14 yards instead of steering it towards goal. What a strike! Out of the blue, Aberdeen are back on level terms as Adam Rooney, who has looked so ineffectual until now, latches on to David Goodwillie's head flick and sends a 25-yard drive past the despairing fingers of goalkeeper Alan Mannus and into the far top corner. TV replays of that Lee Croft chance suggest the winger was a yard offside. The Dons would have had grounds for complaint if that had gone in. "The better players on the pitch have been St Johnstone players. They have put pressure on a very good Aberdeen side and have started the second half the same way as they did the first." Lee Croft squanders a great chance to extend St Johnstone's lead as the winger races into the penalty box but fires his low drive across goal and against the face of the far post from 12 yards. Aberdeen kick off the second half and manager Derek McInnes has already made a change, with young forward Cammy Smith replacing Willo Flood, the Irish midfielder putting in a poor performance on his return from injury. Brighton & Hove Albion say they have agreed the signing of Israel midfielder Beram Kayal from Celtic for an undisclosed fee - subject to a successful work permit application. The 26-year-old passed a medical earlier today and will sign a two-and-half year contract until the summer of 2017 - subject to a successful work permit hearing next Wednesday. Jack Murphy: "St Johnstone flying in with some reckless tackles. Wouldn't be surprised if Aberdeen's injury list gets longer tonight." Alan David Duncan: "AberdeenFC looking pretty jaded so far. No spark, no energy, and fragile. Time to freshen the team up Derek?" "Aberdeen have 45 minutes to save their title challenge. Because, if they lose tonight and Celtic win tomorrow, they will be four points behind and Celtic will have a game in hand." "The really pleasing thing is the intensity with which we have approached this game." St Johnstone have won six of their last seven home games and appear to be on their way to another victory as they thoroughly deserve to be leading at half-time. The crime count mounts as Mark Reynolds is shown the yellow card for a foul on that man Chris Kane and Steven Anderson's overhead kick from the free-kick is deflected wide. Aberdeen at last begin to exert some pressure as goalkeeper Alan Mannus claws a Niall McGinn off the goal-line. From the resulting corner, David Goodwillie's header crashes off the face of the crossbar before eventually being lashed clear. St Johnstone defender Gary Miller is next to go into the referee's book for a foul on Jonny Hayes. St Johnstone midfielder Murray Davidson was booked in the lead up to that Dons chance after a crunching challenge on David Goodwillie. Aberdeen race up the other end and Jonny Hayes' low drive deflects off Brian Easton and over the St Johnstone defender's own crossbar. Aberdeen have goalkeeper Scott Brown to thank for staying only one goal behind after a double save. He perhaps should have done better than beat away David Wotherspoon's drive, but he recovers excellent to prevent Chris Kane scoring with the rebound and the Dons eventually lash clear following a goalmouth scramble from the resulting corner. Aberdeen try to respond immediately, but Ryan Jack's low drive is saved by Alan Mannus. Simon Lappin lashes home the opener after David Wotherspoon goes up to challenge Dons goalkeeper Scott Brown and the ball falls to the midfielder eight yards from goal. Steven MacLean is the first to go in the referee's book, the striker having fouled Aberdeen defender Shay Logan. For those of you who don't know much about the man of whom former St Johnstone winger Allan Preston is waxing lyrical on BBC Radio Scotland. Chris Kane is 20, born in Edinburgh, has come through the McDiarmid Park youth system and has just returned from a loan with Dumbarton, having scored five goals in 13 appearances for the Scottish Championship part-timers. Willie Miller has just described him as "a bit of a pest". Aberdeen almost sneak a goal against the run of play as Peter Pawlett pounces on David Wotherspoon's back-pass, but goalkeeper Alan Mannus does well to block as the midfielder slides in to direct the ball towards goal and Adam Rooney can only slice the follow-up wide. The Aberdeen defence are still looking uncomfortable but are handed a bit of a respite as a foul is given as goalkeeper Scott Brown goes up to challenge for a free-kick lofted into the penalty box. 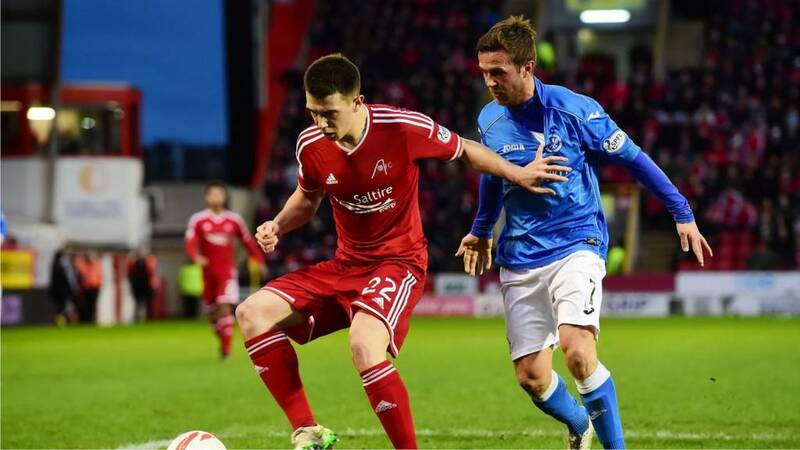 "Aberdeen are not used to teams taking the game to them in this way. Chris Kane has upset Andrew Considine early, but Mark Reynolds is looking upset as well." bringthemonjpn: "The Dons need to slam the door somewhat with a 5 or 6 nil win." Alan David Duncan: "AberdeenFC starting line-up. Hope the Saints boys have got their extra-thick shin pads on!" story about Ibrox and Mike Ashley loans. Meanwhile, in Twitter land, everyone is asking what it means for the Murray Park training ground, which has already been used for security. Thomas O'Moore: "Can see Murray Park being sold for housing at this rate!" Aberdeen at last have a sight at goal of their own, but Niall McGinn's effort is poor and bobbles well wide from 25 yards. Aberdeen are all at sea and David Wotherspoon sidesteps Mark Reynolds as the defender sells himself on the edge of the penalty area, but the Saints midfielder lashes his drive a couple of feet over the crossbar. Chris Kane again! The young striker fires an early shot that whizzes just wide of Aberdeen's far post from just outside the penalty box. Chris Kane is causing the Dons defence all sorts of problems and his quick turn is thwarted by a Mark Reynolds trip just outside the box. Simon Lappin's free-kick is whipped into the six-yard box and flies just wide of the far post. Aberdeen goalkeeper Scott Brown has to be quick off his line as St Johnstone striker Chris Kane burst into the box after nipping the ball off the toes of Andrew Considine. St Johnstone kick off at McDiarmid Park and are immediately on the attack. "Form would indicate that Aberdeen would be firm favourites, but there last performance here was lacklustre. However, I still fancy Aberdeen as they have goals in their locker and too much for St Johnstone." "The last game against them, they gave us a bit of a pasting, so I hope Alan Mannus is not going to be as busy. "They are one of the best teams in the league and have a lot of goals in their team. "We had a good performance and result against them earlier in the season. "They are hurting and I am looking for us to improve on what we did on Wednesday night and hopefully that will be enough to give them a good game." "You can't criticise the players for losing those goals and points against Dundee after that run we were on. "We have put Andrew Considine in and play Jonny Hayes at full-back with Ash being out for four to six weeks. "So we might add to our squad before the close of the window. "It was very unlike St Johnstone the other night and they usually respond to disappointments. "They never make it easy for you, especially at McDiarmid Park." St Johnstone make six changes to their side following the midweek defeat by Inverness. Steven MacLean, Murray Davidson, Gary Miller, Lee Croft, Brian Easton and Chris Kane come into the starting line-up. Aberdeen make just one change, with midfielder Willo Flood coming into the side to replace injured defender Ash Taylor. That sounds like there will be a bit of a reshuffle in the side. St Johnstone: Mannus, Miller, Anderson, Scobbie, Easton, Croft, Davidson, Lappin, Wotherspoon, Kane, MacLean. Subs: Wright, Graham, Banks, Caddis, Brown, O'Halloran, Kitchen. Aberdeen: Brown, Logan, Reynolds, Considine, Hayes, Pawlett, Jack, Flood, McGinn, Goodwillie, Rooney. Subs: Langfield, Smith, Robson, Shaughnessy, Masson, McManus, Shankland. News just in - and it is yet another twist in the Rangers saga. The Scottish Championship club's board and Mike Ashley have agreed that Ibrox Stadium will now not be used as security over any further loans from the Newcastle United and Sports Direct owner. That suggestion had led to protests from Rangers fans. Full story to follow on the website. Aberdeen have lost on their last two visits to McDiarmid Park, including 1-0 in August, but defeated Saints 2-0 at Pittodrie in their last meeting on New Year's Day. St Johnstone have lost three of their last four fixtures but still lie sixth in the table. A win tonight and they will narrow the gap between themselves and Hamilton Academical to four points and extend it to six points between themselves and Dundee below. Aberdeen's run of seven consecutive clean-sheet victories came to an end with a 3-3 draw with Dundee in midweek. But two late goals ensured that they are looking tonight to extend their unbeaten run to nine games. St Johnstone midfielder Chris Millar is a guest on BBC Radio Scotland's Sportsound and has been getting a bit of ribbing by the panel after describing his injury as "a grade-one tear". Host Dougie Vipond has invited listeners to describe the worst excuses they have heard from footballers for missing games. Tweet us on the live text or text at 80295. Welcome to our live text coverage of the first Scottish Premiership fixture of the weekend. It's Aberdeen looking to return to the top of the Scottish Premiership as they visit inconsistent St Johnstone in Perth.